We thought why not?... So off we went. From now on, you can follow the adventures of everyone at Tuenti in the development, product and design teams at our brand new Medium profile @tuentimakers. Of course, we'll keep the entire history of this blog so you can check out what we've written about Activity detector, the Tuenti app for Apple Watch or the write-ups of the Tuenti Challenge 6 whenever you like. In Tuenti we have had to deal with this kind of problems in different situations. One clear example is the Tuenti chat: we want to notify the user about new messages playing a notification sound, but we don’t want to play it when the user is already paying attention to the conversation, we only want to play the notification sound when the page is in background to take the user’s attention. When a user enters to your page, the browser fires a focus event in the window object. In the same way, when the user changes to a different tab or application, the browser fires a blur event. Well… it depends on what you really need. With this simple code you can know whether the user is in your tab, but what happens if the user is in your tab but he has left the computer and is in the bathroom? We can listen to DOM user interaction events to know if the user is actually using the page, and when we have not heard any event for a given time span (for example 30 seconds) we can assume the user is not active. 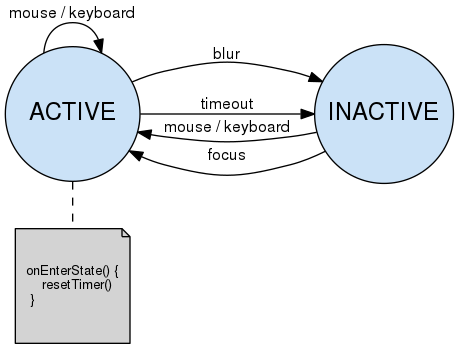 Some events we can listen to are: click, mousemove, keydown, etc (for desktop devices), or touchstart, touchmove, etc. (for mobile devices). So we can attach some event listeners to the document and toggle the inTab variable in the previous example to true. But, when we change it to false? when it has elapsed 30 seconds since the last event. This behavior can be implemented with a setTimeout, but we also need to reset that timeout (with a clearTimeout) when we hear a new event. How this work? the library implements the algorithm we have presented in the previous state machine diagram. When you create an instance of activity-detector you can subscribe to the events active and idle. Those events will be triggered when the user becomes ACTIVE or INACTIVE respectively. And that’s all. Now you can detect when your user is using your page or not. Ok, but I don’t use npm neither ES6. Can I use activity-detector lib? Of course, we have a production ready build (UMD format) that you can simply include in your page with a simple <script> tag, or require it with any module loader (like require.js). You can find it here. If you like it and think it’s useful don’t forget to star it. And if you miss some feature or find a bug please open an issue or, even better, send us a pull request! Another quarter, another Hack Me Up. The 29th edition of our internal programming competition has just finished at the Tuenti office in Madrid. Bots from the sofa was the theme of this edition, which is why projects were focussed on bot technology. Super Call Saving Player, the winning project in the Product category. Jessica, Manolo and Rayco made a new awesome player for the call saving functionality. Tuenti Core was the project that took home the Geek Cup. Sergio made a multiplatform development in C# to show the posibilites of the .net framework. Very geek, indeed. All good things must come to an end. The final phase of this edition of our programming contest has finalized today at our Madrid office far exceeding our expectations. But it couldn’t be any other way, considering that this was the most difficult of the five so far. The 10 Tuenti Challenge 5 finalists came in yesterday to meet the team, so we received them by celebrating with a barbecue at our CTO’s home, as is the Tuenti style. Delta, by Luis Peralta, CTO. Building a VoIP Service using mobile WebRTC, by Pedro Álvarez, Lead Software Engineer. Tuenti Architecture, by Jesús Bravo, Lead Software Engineer. RM Cycle in Tuenti, by Jose Plana, Senior SRE Engineer. We have been left speechless. This edition has been enormous and we are extremely grateful to the more than 2,300 registered participants, the almost 900 participants that solved at least one problem, the top 50, the top 10, and the champions for having made all of this possible. Thank you very much from everybody on the Tuenti engineering team! And to all of those who didn’t make it to our office today, we hope to see you next year. See you at the #TuentiChallenge6, mates!